At the next Area Committee meeting we will request from elected members the programme of work, including timescales, for the roads in Marple affected by the work. The meeting included a presentation on "Locality Working" as conceived by Stockport MBC. The objective of "Locality Working" is to investigate local service provision by various means in an effort to confront problems and needs in the community. "Locality Working" should not be confused with "Neighbourhood Planning" which is a statutory right for communities introduced through the Localism Act 2011 to allow them to shape development in their areas through the production of "Neighbourhood Development Plans"
The Greater Manchester Spacial Framework brings together the 10 authorities of Greater Manchester to identify future housing and land requirements. They will produce a statutory joint Development Plan Document to manage the supply of land in Greater Manchester over the next 20 years. As part of Stockport, one of the 10 GM authorities, Marple will undoubtedly be affected. 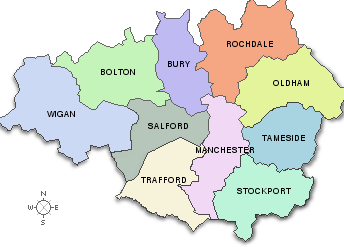 The Association of Greater Manchester Authorities (AGMA) is consulting on the first draft of the GMSF with a closing date of 11th January 2016. 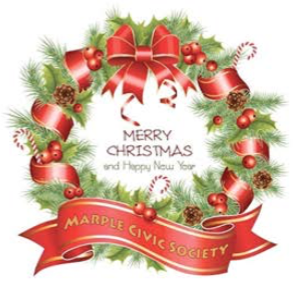 The Civic Society is preparing a detailed response in line with our policies and charitable objectives of protecting Marple from inappropriate development. However we are concious that the failure of Stockport MBC to implement their Allocations plan in 2013 has left Marple vulnerable to external planning pressure. We were delighted to accept an invitation from the Mayor and Mayoress of Stockport to take tea in the Mayor's parlour. The invitation was in recognition of the society's work for Marple and concluded a busy civic year for the committee. 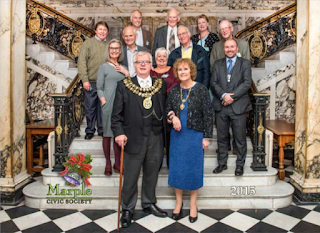 It was a splendid occasion and we thank the mayor and mayoress for their warm welcome and hospitality. 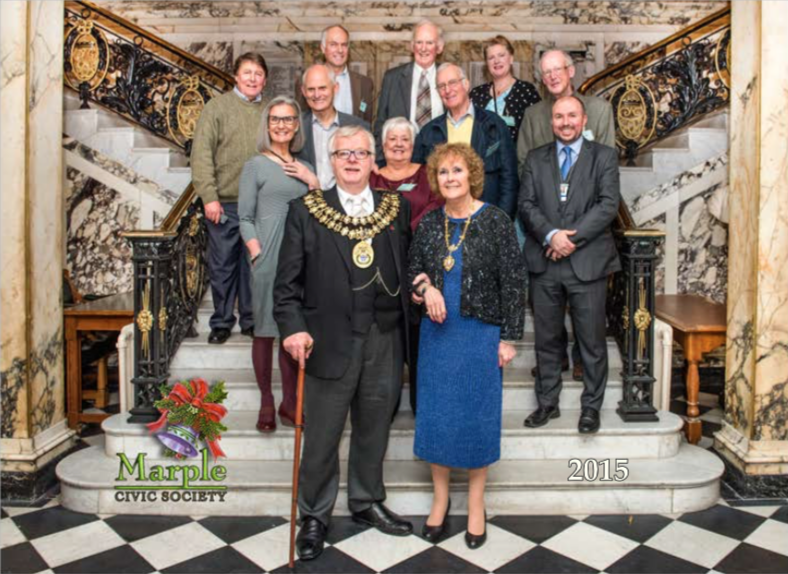 Marple councillors were invited and we were pleased that Councillor Blair joined the party for tea, a tour of the council chambers and a photo to mark the occasion taken on the splendid marble staircase in Stockport Town Hall. Society is delighted to take part. 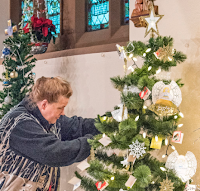 Many thanks to member Kathryn Procter for doing a splendid job in decorating the tree. Thanks also to Arthur Procter for his assistance and photographs. Kathryn came up with the idea of an angel themed tree and set to work crafting handmade angels out of paper doyleys. If you have time to pop into St Martins Church on Brabyns Brow to see the Festival, a lovely christmas treat awaits you. 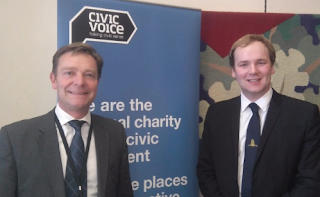 Civic Voice recently held the first meeting of the All Party Parliamentary Group (APPG) for Civic Societies in Parliament. It is good news for Marple that our MP William Wragg has taken up the position as Vice-Chair particularly as the built and historic environment is the priority of the group for the year ahead. Civic Voice, the national charity for the civic society movement, works hard to promote the work of civic societies and to influence the government agenda. One way of doing this is through a well supported APPG. The group previously had 70 members but this time round aims to increase that number to 100. The APPG meetings will focus this year on the impact of the loss of conservation staff, the importance of communities in local heritage listing and the impact of development on Cathedral cities.